Everyone crowded into the Colosseum to get into the Warner Bros presentation today at CinemaCon. Fresh off the Warner Bros 2013 presentation at CinemaCon we have a few thoughts on their upcoming slate for the rest of the year and their presentation as a whole. They went through their films as they will be released this year, we’ll do the same . . .
After Man of Steel, the footage shown of Gatsby was probably what had me invested the most in any of the films shown in Warner’s presentation. Essentially it was a five to six minute long trailer with a lot of footage that we haven’t seen in other trailers. The footage shown and the way the trailer/preview was cut together gave a rough outline of the story of the film. Every single second of footage was gorgeous to look at and the 3D was pretty good. On the whole we don’t really get anything new in terms of character or tone from for the film . . . all that you can get from previous trailers. However, the cinematography, effects, and scope that the footage showed was impressive to say the least. I wasn’t all that excited for The Great Gatsby this summer, but after today’s presentation, I am now. The highlight of this presentation had to have been director Todd Phillips speaking to the crowd of movie exhibitors before showing the latest trailer to the film. He joked about opening against Fast & Furious 6 and how his mom doesn’t like movies. Aside from that we didn’t really get anything all that new. As mentioned they just played the latest trailer from the film which is a variation of the one they already had before. Was hoping for some selected clips but it was not to be. Oh well, the film does come out in five weeks. Of course everyone was pumped to see the latest footage from the new Superman film but with director Zack Snyder intro-ing the trailer . . . he sort of put me to sleep rather than pump me up for what we were about to see. However, the awesomeness of Superman and seeing more of the story and how Superman uses his powers was definitely jaw dropping and sight to behold. While we get to see origin story setup stuff in the first two minutes of the three minute trailer, its that final minute where we get to see just what this new Superman can do. From Supes flying around and throwing things to Zod yelling “I WILL FIND HIM” the trailer excited nearly the entire crowd in the auditorium. Is it June yet? Guillermo del Toro came out on stage to introduce the footage to Pacific Rim and whereas Zack Snyder kind of put a damper on things, del Toro talked about his love of monsters and giants robots and how working on his film has been a joy since he has gotten to see those two things everyday for the past couple of years. His sincere happiness talking about his film was a welcome introduction to the robot-on-monster carnage that we ended up seeing. While essentially what was shown was a long trailer (the one shown at WonderCon from what we’ve heard) we definitely get more of the setup of the story on how humans are fighting monsters with huge robots. The new nugget of story is that apparently the human race’s plan to use robots against the monsters was working, but something has recently happened and the monsters seem to be gaining the upper hand. I was really excited to see more of the robots fighting in the scenes that they showed; especially the one towards the end where the robot bashes in the head of one of the monsters and then while it looks like the monster might be done in, he shakes it off and roars. Definitely excited to see this film. Things started to get a little more interesting as we got into Warner’s post summer slate as we got to see never before seen footage from films coming out in August and beyond; the first of which being the sequel/prequel to 300. While director Noam Murro said there was some unfinished effects work in the clips we were about to see, I really didn’t notice anything that was still in production. Basically we were shown a rough cut of a trailer for the film. The look and feel of 300 is still there, but it looks like this time the scope and world building take on a much larger canvas. You have warships battling at sea and a hordes of fighters battling it out. Probably the thing that intrigued me most was Eva Green’s character. Looks like she’s serving Xerxes and going to be the bad guy in it. Overall I wasn’t blown away by anything. Looked like an extension of 300 and I really couldn’t get a good feel for the story from the footage they showed. We’ll have to reserve judgement till it comes out in early August. The last piece of footage I’m going to dedicate a section to was for Alfonso Cuarón’s Gravity. High anticipated due to the director’s previous work (Children of Men, Harry Potter and the Prisoner of Azkaban, Y Tu Mamá También) as well as its two high profile stars Sandra Bullock and George Clooney, the film was on everyone’s Oscar watch list last year as most figured it had all the trappings of Oscar-bait written all over it. After getting pushed to 2013 anticipation grew still. With only the log line of ‘two astronauts being stranded in space’ to go on, many wondered how a two hour film with just Clooney and Bullock drifting around would work. Sadly this question was not answered after seeing today’s footage. 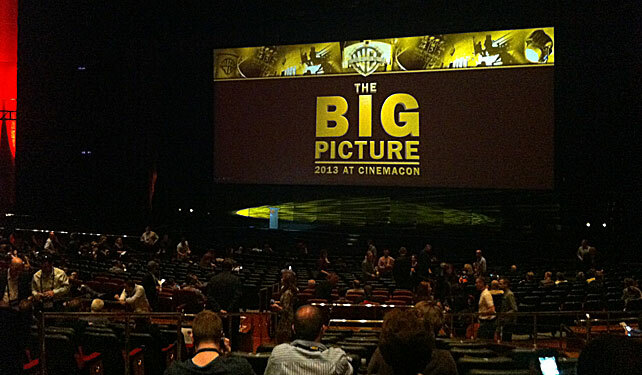 Today at CinemaCon we got our first look at Cuarón’s Gravity and what I image to be the first portion of the film. In the footage that we screened today we saw the devastation of the station that Clooney and Bullock’s characters work on and the beginning of them getting stranded. Hardly any dialogue was given save for the errant radio communication between astronauts. A lot of visual effects work was on display in the destruction and there wasn’t any hint of the vastness of space that everyone is expecting. Though great to get a first look, I feel like we still didn’t see enough to give us a good idea of what to expect from this film. While Warner Bros did show footage from every other film that they have coming out this year, everything else on their slate was still in production and not a lot was shown OR were titles that they don’t feel too confident in enough to show the crowd hardly any footage at all. The best of the rest included a good long trailer for ‘We’re the Millers’ a comedy starring Jason Sudeikius and Jennifer Aniston who put together a fake family to transport weed across the Mexican border. The footage for The Conjuring actually gave us a lot of setup and backstory–footage and storyline that aren’t in the current trailer. A few scenes were put together to give the audience a rough idea for what the plot of Prisoners will be; a drama starring Hugh Jackman and Jake Gyllenhaal where Jackman’s daughter is kidnapped and Gyllenhaal’s character sets out to find her. After that teaser ‘sizzle reels’ were shown for Getaway and Seventh Son; nothing to spectacular there. Probably the biggest omission on from the backend of Warner’s slate was any new footage from The Hobbit: The Desolation of Smaug. Granted the first installment of The Hobbit came out just five months ago and Peter Jackson did pre-record a message saying they were still in production on the second and third parts . . . but still, I found it hard to believe that they did not have ANY footage to show. Other movie bloggers speculated that after the negative reception CinemaCon goers had to 48fps last year that Warner’s scrapped any footage this year. Based on what I heard about last year and the lukewarm numbers that 48fps brought in this year, this isn’t hard to believe. To say that Warner Bros presentation was disappointing would be an understatement. From what I heard about the Paramount’s presentation Monday evening and Universal’s presentation earlier this morning Warner’s seemed in position to outdo both of them with the slate that they have coming up and they totally fumbled it. What it really comes down to is that while we did see some new footage for a lot of the summer films and films from later in the year; there simply wasn’t enough of it. Most of what Warner’s showed had previously been released, either in trailers or clips posted online. Seeing all of this again didn’t really do anything to get me excited. Sure the crowded laughed and cheered when they were supposed to–a good movie will always make their audience do that. What we got was recycling of footage that most of us movie geeks have seen before and it played like watching reruns of Saved by the Bell . . . still fun to watch, but nothing really new or exciting. Hell, even the exclusiveness of the Man of Steel trailer wore off pretty quick as it was posted online only a few minutes after it was screened in the Colosseum. What’s the point of hyping up this stuff to the people that show it off in theaters if you’re just going to release it to the public right after? There’s no need to fly to Vegas if that’s the case. Also, Warner’s didn’t have any star power to backup any of their films. Oh sure they had Zack Snyder, Guillermo del Toro, and Todd Phillips to introduce their respective films, but none of the stars from the movies showed themselves. Granted having a star on hand to sing praises about their film won’t do all that much in the grand scheme of things. But when everyone else is doing it and you don’t; people notice that. Warner Bros made it a point to say that they’re the only studio to have twelve consecutive years of multibillion dollar box office grosses for their films . . . lets hope that their slate can sell itself because they sure didn’t at CinemaCon this year.